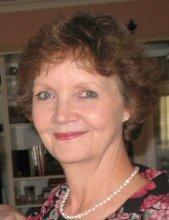 To tell you a bit more about me, my name is Kerry Godsall and I live on the Darling Downs, in Queensland, Australia. I am a self taught artist and I am here to show you that you can draw too! I have been blessed with a beautiful family. I lost my Dad in 2004 but I am grateful that he almost reached the grand age of 80. We were really good mates. My Mum is my best friend. She is a member of a local art group and she encourages me with my art. I married a lovely man in 1987 and, to this day, we laugh together a lot. I have a terrific son (from a previous marriage) and he was lucky to find himself a sweet wife. They created a little blue-eyed, precious girl with beautiful blond curls (born in late 2004). Yes, my grand-daughter, who stole my heart without a backward glance! Update: I am excited to announce the long-awaited arrival of my 2nd grandchild, a boy, born in February 2012. This means more playtime for me! Being a kid again is wonderful and I happily use my grandchildren as an excuse for not acting my age. I have 3 sisters and a brother who are also my best friends. I know I am lucky -- I love all of my nieces and nephews as if they were my own children. My life revolves around my family plus my closest friends. 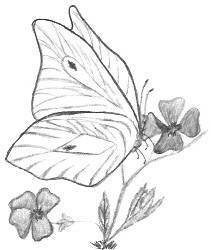 I include butterfly drawings on this page because they have a significance in my life. 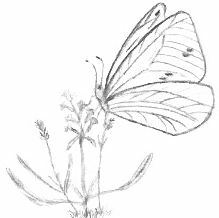 On the butterfly drawings page, I mention that "The ancient Greeks believed that the soul left the body after death in the form of a butterfly." Ever since my Dad died, I notice that a butterfly appears at important family events or at times when I really need support. I think it's just a little reminder that my guardian angel is with me. Anyway, I didn't start drawing until a couple of years ago (I was over 40) when I caught myself studying faces and features and mentally drawing them. I discovered I can draw really well in my mind!! So I started copying anything and everything. My Mum and sisters lent me some art books and I did all of the exercises in those. I was quite pleased with my efforts -- not bad for someone just starting out. With this website, I aim to help you find your inner artist by showing how easy it is to create a drawing in a do-it-yourself style. I also wanted to share my drawings here with you to encourage you. If I can draw, so can you! Copy the outlines, see that you can do this too, and work from there. It is exciting to develop something yourself and I can't hide the fact that I just love it. I mentioned to my Aunt Ros (who is a well known local artist) to feel free to criticize my drawings as any new ideas would be welcome. She replied that "art comes from within and can't truly be criticized". Isn't that nice? It's a bit like freedom of speech only there is a freedom in drawing. "Never believe that a few caring people can't change the world. For, indeed, they are the only ones who ever have." I was greatly encouraged after reading your newsletters and other materials, specially when I realized that I was always going to make mistakes. But you opened my eyes to the possibilities. With patience, an eraser, tracing paper and some imagination, then more patience, I could produce a reasonable sketch, at least for my purposes. I wanted you to see what you have done with your encouraging words. You gave me confidence. If I can give you some wise advice, it would be to never compare your drawings to others. I don't need to tell you that we are all different. Some people will love your work and others won't think much of it. That's just the way of the world. There is also no reason why cruel or thoughtless words should stop you from drawing! You are in charge of your life and if it's something you want to do, please keep going. I only remember the messages that encourage and inspire me. The good outweigh the bad and it's truly worth it to glide over any negatives. If you are interested to know how I built this website, it is my pleasure to share everything I know with you. If you want to be notified when new drawings appear on the site or to learn more drawing tips, I invite you to sign up for the free newsletter. When I was teaching myself to sketch (it's a bit different to drawing), I took notes of all the tips that really helped me and I created my first online book called The How To Sketch Guide. After I received a few requests for the How to Sketch book in paperback, I then went on to have my first ever book published. 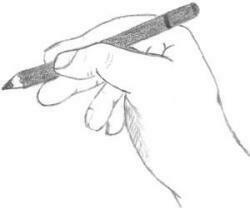 It's crazy how life turns out -- this all started with a little urge to learn how to draw. Now here I am with a website, an ebook, a published book and a Kindle book. It's been quite a journey but I'm so proud that I did it. The fact that you are here with me, well, that makes it all the more special, thank you.